Happy Hour weekdays 4pm-7pm with discounted drinks and appetizers, great music & friendly service. Live acoustic music every Tuesday night from 6pm. Let us cater your next event! Our full a la carte and function menus are available for off-site delivery. Our mezzanine is a private area with its own fully stocked bar and separate AV system. With a dedicated bartender and server, this space is suitable for private parties of 20-80. Our restaurant may also be hired out for groups of 50-70, or the full venue for groups of up to 200. A Little Snippet Of Australian Culture In The Heart Of Nyc. Located Minutes Away From Times Square And Theatre District. A short walk from Grand Central Station and Penn Station. Ultimate sports bar with 22 tv's and the place to watch Live Rugby and Cricket! 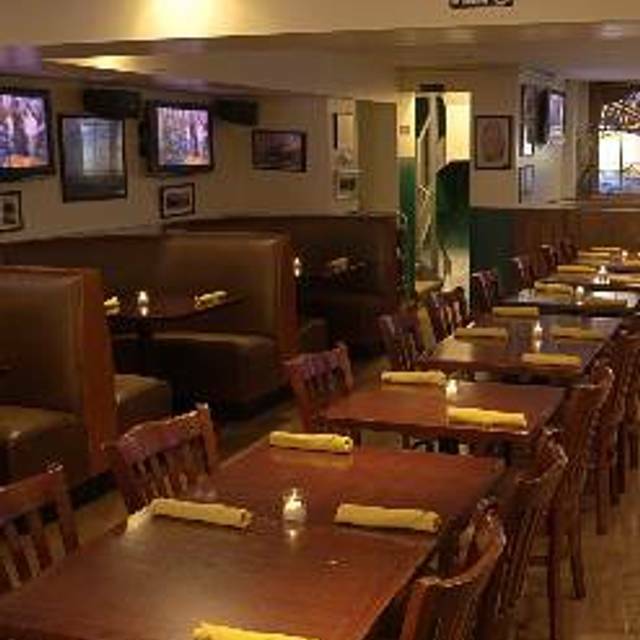 A great spot for birthdays, and corporate happy hours. (3) Three Mini Buttermilk Chicken Burgers topped with Swiss Cheese, Bacon, Lettuce, Tomato and Honey Mustard. (3) Beer Battered Fresh Cod with Pineapple Salsa and Chipotle Mayo in a Soft Flour Tortilla. Cheese pizza topped with Smoked Ham and Pineapple. pan roasted fillet served on a Bed of Spicy Pad Thai Noodles. Crispy Beer Battered Alaskan Cod, Homemade Tartar Sauce & Fries. Combination of Beef, Pork & Veal Wrapped and Baked in a Golden Puff Pastry. Side Option of Fries, Salad or Mash. 8oz Beef Patty, Fried Egg, Bacon, Onion, Beet Root, and a slice of Pineapple with the choice of Cheddar, Swiss or Provolone Cheese. Shredded Romaine Lettuce tossed in our Homemade Caesar Dressing. Topped with Homemade Croutons, Hardboiled Egg and Parmesan Cheese. Available Monday - Friday 11:30am- 4pm Sorry, No Substitutions. Grilled Chicken, Romaine Lettuce, Homemade Dressing, Croutons, Hard boiled Egg and Parmesan Cheese. Avocado Hand Smashed on 2 Thick Slices of Sourdough with Smoked Paprika & Pomegranate Seeds. Edible Australian Hibiscus Flower, Pama liquor topped with Sparkling Wine. The whole experience was ok... Not great, not bad, just ok. The ambience was pretty good - I could watch AFL my friends lamb was overdone and a little tough. They were also out of stock on some of the beers. They were going thru a menu change so this might have been part of the problem. We went for trivia and it was a blast! We’ll be back again for sure!!! We're from Australia and now live in upstate NY so having been there on a couple of occasions, especially Jan 26 (Australia Day) when on a Saturday, we knew there would be a party atmosphere. We took friends with us to experience the crazy Aussies and our unique food. 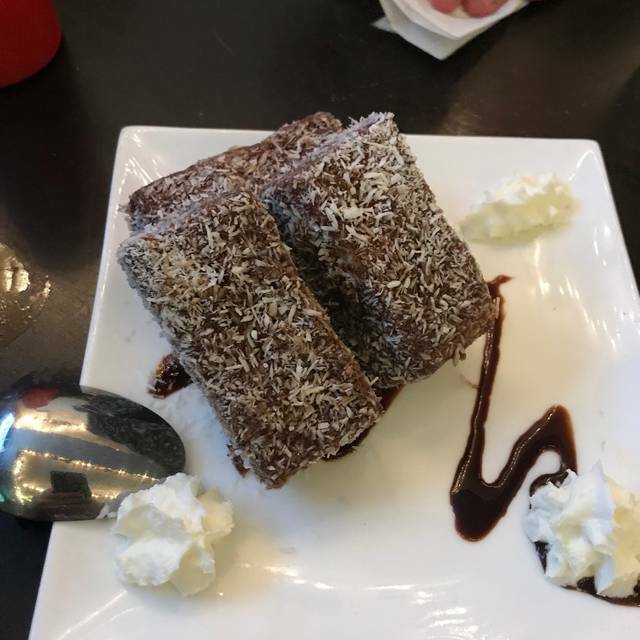 Kangaroo, meat pies and sausage rolls washed down with Cooper's Ale and Lamingtons - can't go wrong! I didn't expect this place to be so much like an American sports bar. I put 3 stars for each category because nothing was bad, nothing was excellent, just fine. Mostly my friend and I wanted to try something different for Restaurant Week. We expected we would be provided a different menu from their normal daily menu but this was not the case. We were ready to throw down some extra cash for this annual event and found the food and service not worth the bill. Next time I do Restaurant Week I will call and ask if a special menu is provided or discount deals at a good quality restaurant. Hello there, I apologize for any misunderstanding about restaurant week. I understand how frustrating it can be to go out to a new place and expect something different that they don't offer, but unfortunately we don't participate in Restaurant week. We may in the future but we have chosen to opt out every year so far. May i suggest next time Restaurant week comes into town, check their website for a full list of participating restaurants and also a list their special menus as well. Cheers! This bar is what it is, noisy, though not as noisy as what it should be for Australia Day, or the day before, and we contributed to the noise. Food is passable, and a bit better than previous, but you go there for the ambience, good friends, and drinks. The bar staff are attentive and efficient, and always willing to help. Hi Marion, What beers were you looking for? We carry every Aussie beer that's available for import. We've been trying for a while to get more over here but most of the Aussie brands won't ship or if they do it's not reliable. Same thing goes with the Bundy, we only have it in stock anytime we have a mate smuggle some over. We try our hardest to give NYC a little piece of home. I do hope you give us another shot in the future, Cheers! Absolutely awesome a friendly bar. Would highly recommend all Aussies and everyone visit the Australian pub. We came here on a Sunday night. Got seated right away. Everyone was very nice the moment we got in. The server made sure we ordered the best dishes and everything tasted great. Would definitely come here again! The two owners, waiter, and waitress were friendly, accommodating, and periodically checked in with us as we waited for a table. The variety of food which included grilled kangaroo skewers peeked our interest in having an authentic experience in NYC. And even though the rugby fans filled the restaurant one early Saturday morning and cheered on their favorite team, our overall experience was still superb. We went there for a 90s Trivia Night and felt that our age group was not something that the Australian catered to. Many of the questions were for an older generation which is a shame because we were very excited for weeks for this. I met a former client after work to catch up. I picked this place, because I've been here several times before, mostly for lunch. It was Friday night, so it was super-noisy. It was difficult for us to hear each other. The food is great, and the happy hour deals are pretty good, although some portions are small. I'll be back, just probably not on a Friday night! Great place to watch your favorite sport with good ambiance, beers and food. Definitely will be back there soon. take forever to get our food...the 3 tables came after us but got the food before our table. even one of our friend who came after us got her food before us. We wanted a place to watch the Australian NRL games. They were very accommodating and put JT /Cowboys last game on for us at our table and at the bar prior! We had meat pie and it was delicious. We will go back one more time before leaving NY! Try to go here if you want a good sports bar with a great vibe. Easy location and good sports coverage. Hot wings are exactly what it says on the tin! Sadly the night we went they were out of kangaroo, out of lamingtons, and out of Pavlovas. If you are going for those items call ahead top check. Matt the owner was warm and friendly. Andrew the waiter was what you would expect and so much more. This is a lovely pub. The lovely Aussie beer and great happy hour is well worth the visit. The staff makes up for any shortcomings. Great for watching World Cup, very lively crowd. The place was packed and our service was still outstanding. Great food too with kangaroo on the menu! Was looking for an interesting place to take out of town guests. Based on reviews The Australian seemed like a solid option. I knew it would be a pub in an overpriced area but I was still disappointed. Went for a Villanova Game Watch and had a tremendous time. Great environment, excellent food and beverages and a special menu for the game with outstanding prices on select drinks and food items. The owner came over and introduced himself and shared stories about his Villanova affiliation and was appreciative of the affiliation. Great experience! Australian restaurant so went for the leg of lamb. Way over cooked. Rare, medium rare, medium, all the same. Very chewy, not cleaned of tendons. Veggies over cooked as well. Tiny Bacon pieces on sliders. Very poor food. I was planning to have dinner here but once I arrived with my friend we had our drinks and left. Had my bday drinks here amougst some attractive Aussies. Lots of great laughs with friends and the staff. Jess T was fantastic and made the experience a lot of fun. Prices are great, and everything gets brought out at the perfect time. Great pub, great food, great service. I have had multipe nights and afternoons at this pub. The atmosphere is great, with plenty of TVs....plus a heavy hand by most bar staff is always welcomed. Good place to meet for pregame or a quiet afternoon of relaxing. My food was pretty ordinary (fish and chips) but my daughter enjoyed the salmon she ordered. Despite booking, there was no reserved table for us and we were made to feel a little as though we were in the way. I was hoping for a great experience as it was New Years Eve and we always visit The Australian every time we are in NYC but this time the experience was pretty ordinary and disappointing. So we left early - not bothering to see in the new year there. On the positive side, our server was very friendly and very accommodating. Really friendly. Great food. Would highly recommend. I love meat pies, this is the only place I have seen in NYC that offers them. Sadly, the meatpie was just beef in a curst, no real flavor. The sausage roll was just meat pie filing in phyllo dough. My kids had to order three different meals until they actually had something left. The service was very friendly but it took almost two hours to service five people lunch (I guess that's similar to Australian service). Great option for both locals and expats wanting a taste of home. Not too over the top with all things Australian, but enough to give you an understanding of what the team are doing. Great selection of food and drink covering all options. Great Bangers & Mash. Will definitely be going back! For a Thursday night is was very busy and loud. Great bar to relax in after a long day sightseeing. Extensive choice for both food and drinks. For starters, we had chicken wings and squid to share. Mains were steak sandwiches and fish and chips. We did have an issue with our mains however the owner sorted this immediately and certainly did not impact on our night. The portion sizes were good and the food was both tasty and reasonably priced. Added bonus was the live singer. Check out their “happy hour” and drinks offers. Well worth a visit and would certainly recommend to friends and family.